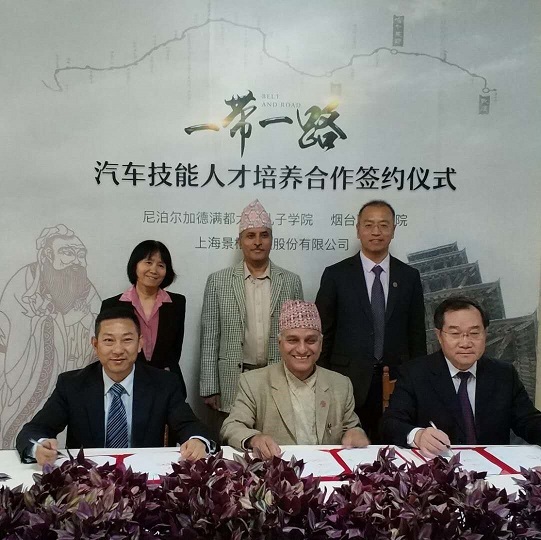 Confucius Institute at Kathmandu University; Yantai Vocational College, Yantai, China; and Jingge Technology, Sanghai, China signed a Tripartite Supplementary Agreement on dated the 14th October 2018 at the Nepalese Embassy of the Peoples’ Republic of China, Beijing. Prof. Dr. Subodh Sharma signed the agreement in the capacity of Registrar and Director of Confucius Institute at Kathmandu University amidst the Representatives from the other two institutions. His Excellency the Nepalese Ambassador to PR China Mr. Leela Mani Paudyal was also graciously present at the occasion. The main objective of signing this agreement is to improve the knowledge and practical ability of auto repair industry in Nepal through training at Technical Training Center (TTC). The three Parties will jointly manage the training personnel, curricula and other logistics associated with effective implementation of the training.